Erin Jones is a nationally-recognized classroom teacher and administrator. She earned recognition as the WA Milken Educator of the Year in 2008. She was a White House Champion of Change in 2013. She is also a lifetime athlete. She attended Bryn Mawr College on an academic scholarship but also played Division III soccer and basketball, holding records in both sports until just recently. Erin had two children, took in a niece, and then was invited to tryout for both the Seattle Storm and the Portland Fire WNBA teams. She was interviewed by NBA Live for being “the oldest woman with the most children” to try out that year. Her tryout in Portland led to an invitation to serve as captain and translator for the American team in a series of exhibition games against the Mexican Olympic Team in Mexico City during the summer of 2000 at 30 years old. Erin continued to play in men’s and women’s basketball leagues until she decided to run for public office. 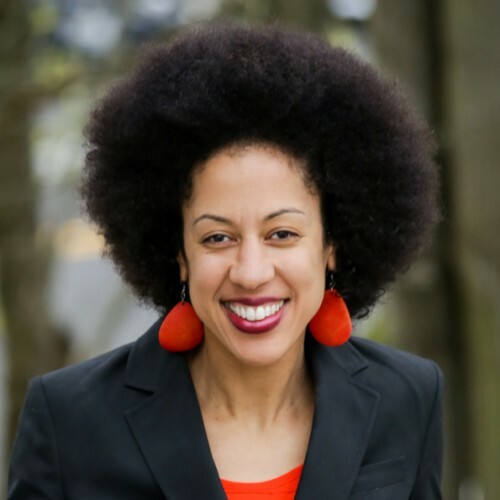 Erin was the first Black woman in WA to run statewide, a race she lost in 2016 by less than 1%. She has spent the last 2 years doing school assemblies, keynote speeches at conferences and training educators and non-profit organizations in culturally-responsive practice and equity. Erin speaks 4 languages (English, French, Spanish, Dutch). She was raised in The Netherlands during the school year, where her parents taught at the American School of The Hague, and in Switzerland for the summer, where her father taught at a computer camp. Erin and James, an educator and former youth pastor, have been married 25 years and have raised 3 children who are now adults. Erin’s greatest passion is to lead by example and to inspire others to become the best versions of themselves. Erin spends her free time writing, running in half-marathons and volunteering as a leader for the youth in her church. Find out more about Erin Jones at https://youtu.be/HQ7xY60a6z4.